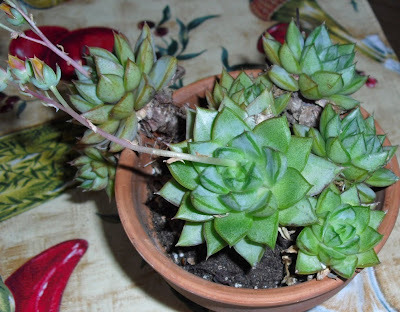 As I've said before, it took me a while before I learned to overwinter most Echeverias without having them look unhealthy and unhappy for the duration. In part 1 of this series, I mentioned that I have had better success by growing under fluorescent lights in my cool basement. Well, there are some exceptions to that, and I'd like to show off a few of them. These are the plants that grow more or less contentedly in my south-facing kitchen window during the winter, in normal house temperatures. Echeveria purpusorum. 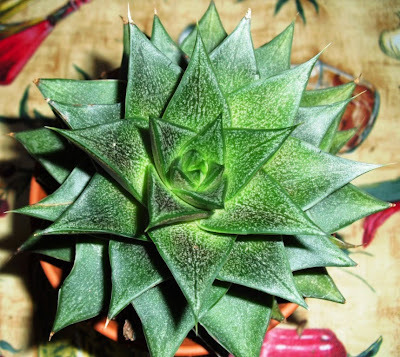 When I first saw one of these, I thought it resembled a Haworthia. Same plant, in a shot that shows the purple coloration better. 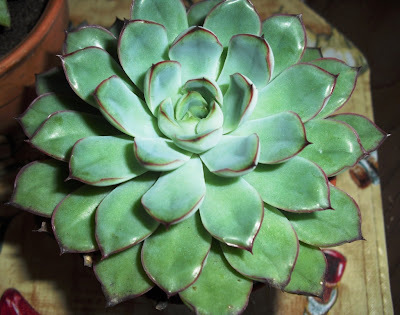 I think this Noid Echeveria resembles E. purpusorum somewhat, in the shape and thickness of the leaves, as well as the dark outlines on the sides and undersides. While E. purpusorum has never bloomed for me, this plant has bloomed three years in a row. I'd love to know its name. 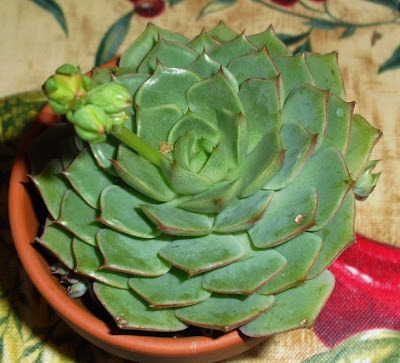 Echeveria pulidonis. 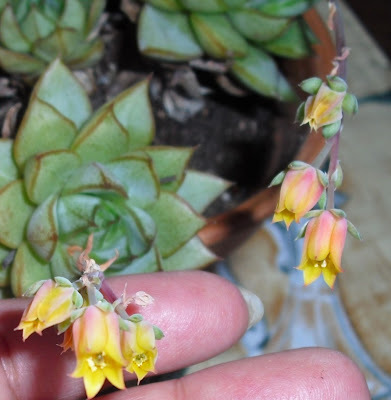 It hasn't produced a stalk yet, but this Echeveria also has yellow flowers, but without even the hint of orange seen in the NoId. I have posted this plant before. The red edges do fade somewhat during winter, but the plant doesn't get leggy. Echeveria ramillette, at least according to the label that came with it. I'll try to post another picture when the flowers open. 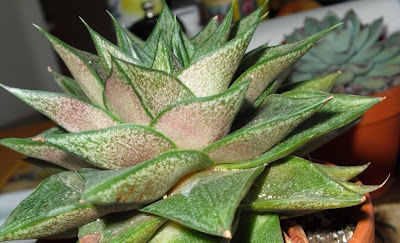 I haven't pictured it here, but I have an Echeveria agavoides variety which also does well in winter without fluorescent lights or cooler temperatures. E. purposorum is very neat-looking. 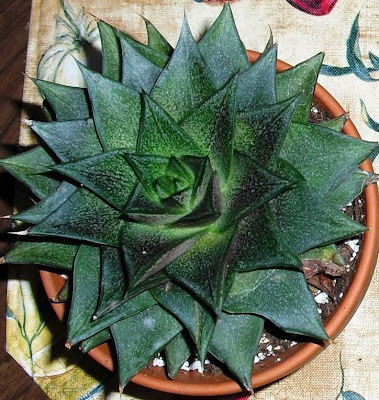 Or possibly I'm just biased in favor of anything that looks like a Haworthia. It's enough to make a person wish he had a south-facing window.